California Division of Mines and Geology, Ferry Building, San Francisco. 1966. “Economic Mineral deposits of the Cascade Range, Modoc Plateau, and Great Basin Region of Northeastern California,” by Thomas E. Gay. Jr. Figure 2. Map showing the location of hot springs and deposits of economic mineral commodities in northeastern California. 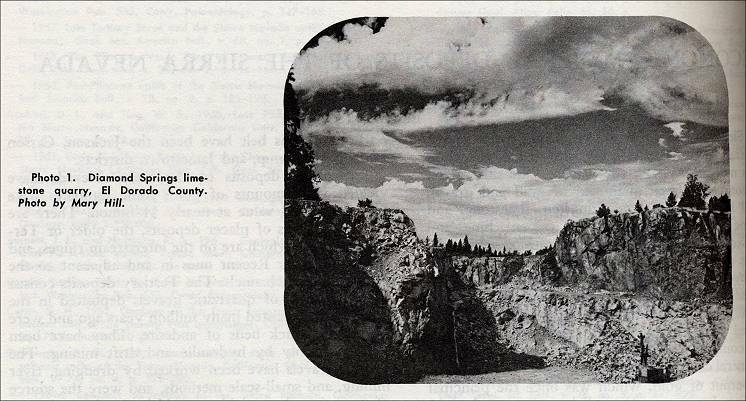 "Various decorative limy spring deposits and siliceous rocks such as jasper, chalcedony, and petrified wood, are hunted by mineral collectors ('rockhounds') in the region. Obsidian also is sought, but it is discussed separately in this article as it has another use. 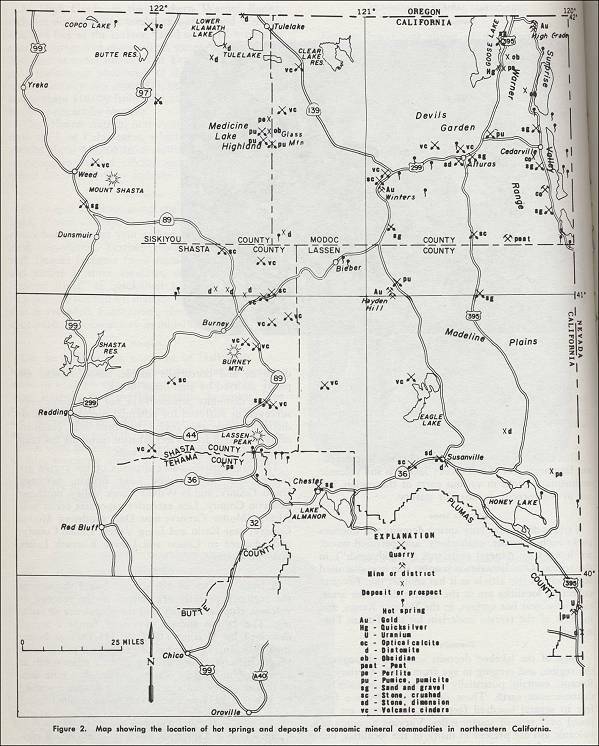 Favorite collecting localities are in the eastern desertlike areas, especially near hot springs, in the Warner Range, and in parts of the terrain underlain by the Tuscan Formation." "Small vein and spring deposits of limestone, of variable purity, were quarried and burned to make lime mortar for local building in various towns of the region, mainly during the 1800's." "Like sand and gravel, and volcanic cinders, crushed stone is produced and used throughout the region in undetermined tonnages, with almost all being used for asphalt concrete aggregate and road building material. Various Tertiary and Quaternary basalt and andesite flows are sources of high-specification crushed stone throughout the region; notable quarries are at Canby Bridge and Likely, Modoc County. Decomposed granitic rock is quarried for road and fill purposes in Honey Lake Valley, Lassen County, and elsewhere Tertiary andesitic tuff breccias and vent agglomerates are sources of crushed stone for road building purposes." 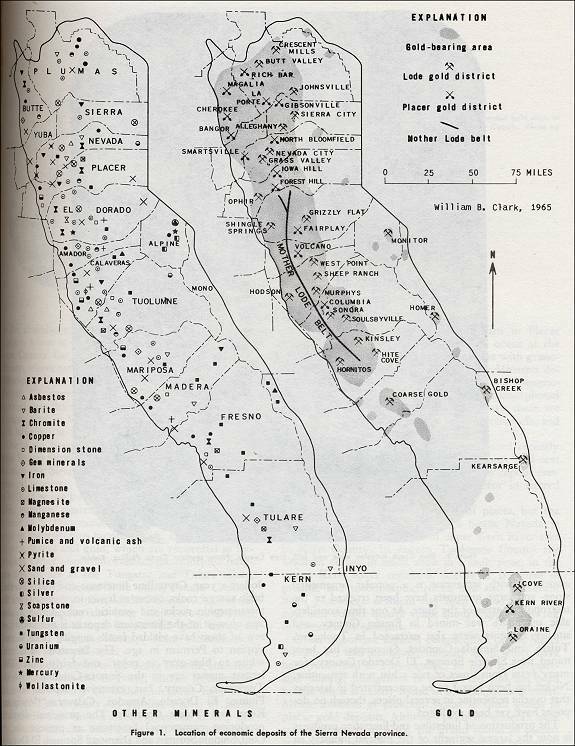 “Economic Mineral Deposits of the Sierra Nevada,” by William B. Clark. Photo 1. Diamond Springs limestone quarry, El Dorado County. Figure 1. Location of economic deposits of the Sierra Nevada province. "The production of limestone and limestone products is now (circa 1966) the largest segment of the mineral industry in the Sierra Nevada, amounting to 10's of millions of dollars a year. Crystalline limestone and dolomite, the basic source rocks, occur as lenses in various types of metamorphic rocks and granitic rock. Although the age of most of the limestone deposits is not known, a few of them have yielded fossils ranging from Mississippian to Permian in age. The limestone usually is white to blue-gray in color, and fairly pure. The largest masses are in the Sonora-Columbia area of Tuolumne County, but extensive deposits are in Plumas, El Dorado, Amador, Calaveras, Mariposa, Kern, and Tulare Counties. 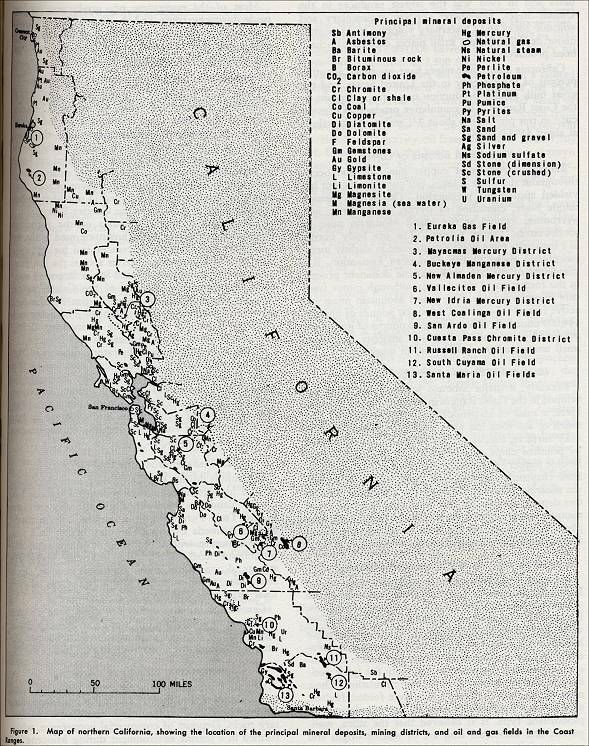 The principal districts producing commercial limestone at present (circa 1966) area at Cool, Shingle Springs, and Diamond Springs, El Dorado County, where most of it is used in beet sugar refining or the manufacture of lime; San Andreas, Calaveras County, where it is quarried for cement by the Calaveras Cement Co.; Columbia and Sonora, Tuolumne County, where terrazzo stone and lime are made, and Tehachapi, Kern County, the site of the Monolith Cement Co. operation. At one time limestone was quarried near Briceburg Mariposa County, for use in a cement plant in Merced County. Wollastonite occurs with limestone at San Andreas and is used in cement." 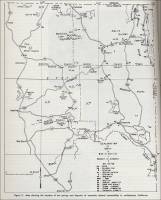 “Economic Mineral Deposits of the Great Valley,” by Earl W. Hart. "Crushed and broken stone are produced intermittently for a variety of purposes from a few places along the perimeter of the Great Valley and from Sutter Buttes, near its center. Some Cretaceous dimension sandstone from the Sites quarry (Colusa County) was used years ago to construct many buildings in the San Francisco area. The most important stone deposit was at Cement Hill, Solano County, where Quaternary travertine was used to manufacture portland cement in 1902-1910 and for lime, flux, and dimension stone at other times. The travertine reserves are now largely depleted. Another nearby travertine deposit at Tolenas Springs is currently (circa 1966) supplying small amounts of travertine and calcareous onyx for terrazzo and other decorative stone uses." 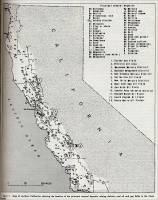 “Economic Mineral deposits in the Coast Ranges,” by Fenelon F. Davis. Figure 1. 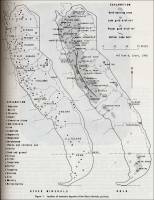 Map of northern California, showing location of the principal mineral deposits, mining districts, and oil and gas fields in the Coast Ranges. Sedimentary Deposits of Limestone and Dolomite, pp. 320. "Large roof pendants of coarsely crystalline limestone and dolomite are found in the pre-Cretaceous rocks of the Santa Cruz Mountains, in the Gabilan Range and the Sierra de Salinas bounding the Salinas Valley, and in the Santa Lucia Range farther southeast in San Luis Obispo County. Included are bodies of high-grade limestone, dolomite, and mixed carbonate rocks in masses aggregating millions of tons. Practically all of the dolomite consumed in northern California originates in quarries in the Gabilan Range. "The Calera limestone member of the Franciscan Formation provides a dense limestone used in the San Francisco area for making cement and for aggregate. The principal limestone quarries are on the San Francisco peninsula, and are located in the largest of many small discontinuous segments of the Calera member that are found extending along the San Andreas fault zone for a distance of about 30 miles. The limestone is thickest, about 400 feet, at the Permanent Cement Co. quarry about 40 miles south of San Francisco. "Large unmetamorphosed limestone deposits of Tertiary age are found in the southern Coast Ranges. The sugar refineries of the Salinas Valley currently use bedded shell limestone from the Vaqueros Formation, which is quarried at Lime Mountain northwest of Paso Robles. Lenses of oyster shells and mud are dredged from the floor of San Francisco Bay to manufacture cement at Redwood City (circa 1966)."